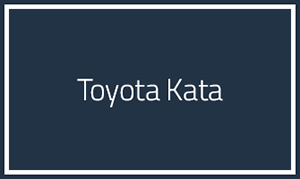 Toyota addresses the concept of management support through a series of behaviors that is now known as the Toyota Kata, meaning routine or practice. Kata is a way of changing behavior and establishing a habit of continuous improvement. Traditionally goals are set but there is never a path or process to achieve and sustain the goals. Kata examines the target condition, the current condition, and through steady experiment and practice, establishes new conditions. The new condition grows ever closer to the target condition. Coaching kata is vital to the process of embedding kata into an organizations culture. In order to apply either of the Kata, the learner should be provided coaching that details each of the patterns and provides feedback as necessary. The coaching kata can help an organization realize the possibilities inherent in other kata. Once you learn the Improvement Kata, the Coaching Kata develops your skill for teaching the systematic, scientific routine of the Improvement Kata through practice in daily work.